Layer states let you save and restore configurations of layer properties and states. You might want a layer to display in blue sometimes and green at other times, or you need some layers to be off or frozen or locked when editing a specific part of a drawing. After spending a lot of time adjusting all layer settings you can use layer states to save your settings. You can save multiple layer states in a each drawing. Layer states can be copied between drawings and you can save a layer state to an external file, which can then be imported in another drawing. To easily create layer states, the Layer Utility commands might be useful. 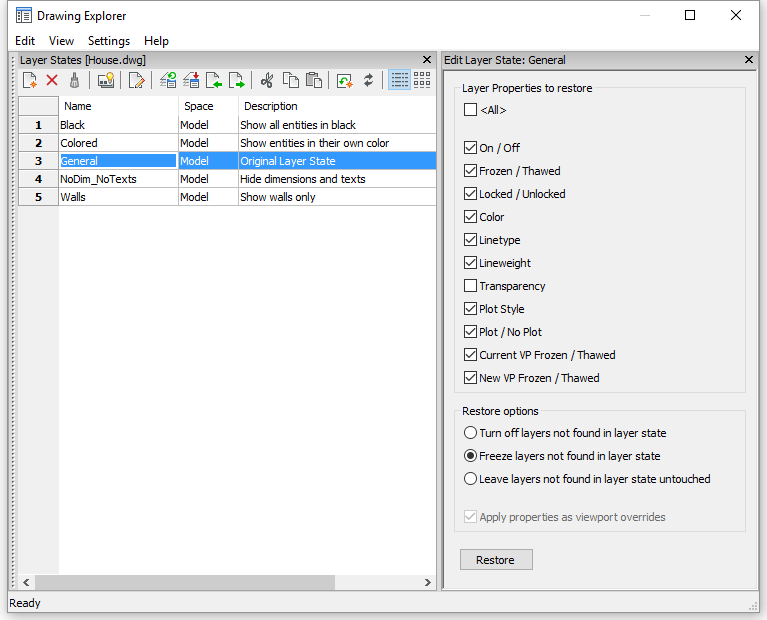 In the Tools > Drawing Explorer menu choose Layer States... .
Click the Detail View button ( ). Click the Icon View button ( ). Open the Layer States explorer. Click the New button. ( ). A new layer state is created. Type a name for the layer state, replacing the NewLayerState1 default name. (option) When in Detail View type a description in the Description field. Select the Layer Properties to restore . Click the check box to select a layer property, click again to remove the selection. By default in a new layer state all layer properties are selected to be restored. (option) Click the Overwrite button ( ) to overwrite the layer state with the current layer settings. If necessary, click the Tree View button ( ). Click the expand button of the layer state. (option) Rename the layer state. 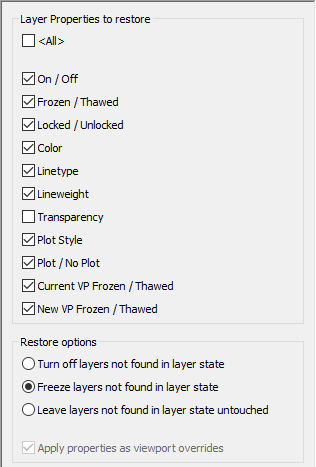 (option) Edit the layer state description. (option) Expand the Layer Properties to restore list. Select the layer state you want to restore. Select a Restore Option . The restore option applies to layers which are added after the selected layer state was created. Optionally check the Apply properties as viewport overrides option, which applies the layer state as viewport overrides (VP layer properties) to the current layout viewport. This option is available only on a layout within a layout viewport. Click the Restore button ( ). Right click, then choose Restore in the context menu. If REGENAUTO is on ( ), it is not necessary to press the Regen button in step 4. Layer states can be restored using the Layer State control on the Layers panel. You can add the Layer State control to a toolbar. Open both, the source and the target drawing. Make the source drawing the current drawing. If the layer states display in Tree View , choose either Detail View ( ) or Icon View ( ). Select the layer state you want to copy. Press and hold the Ctrl key to select multiple layer states. 6. With the cursor on a selected layer state, press and hold the left mouse key, then drag the selection to the target drawing in the Open Drawings section of the Drawing Explorer dialog window. 7. When on the target drawing, release the left mouse button. The selected layer states are copied to the target drawing. Click the Export button ( ). The Export Layer States dialog opens. In the File Name field, type a name for the layer state. Choose a folder to save the layer state in. Click the Import button ( ). The Import Layer States dialog opens. Browse to the folder where you have saved the layer state file. The layer state is imported. If a layer state of the same name already exists in the drawing a warning displays. It is not possible to overwrite a layer state definition.